Last night was cold. Perhaps not as cold as some places in this world, but cold for Auckland. We woke to find frost glistening on the grass in the early morning sunlight. I love the sharpness of the summer sunshine, but to wake to a beautiful clear blue sky brightened by the weakened rays of mid-winter sunshine reminds me that it is truly a blessing to be alive and able to enjoy the changing of the seasons. This beautiful bowl of greenness won me over at a restaurant last year. It was a cold Saturday morning last winter when we headed to our favourite place at the time for a brunch after another early morning soccer session. My hubby had the house full breakfast while I couldn’t let a bowl of something hot and steamy go untried. Served with freshly baked bread I can honestly say it was heavenly. But I didn’t have the courage to ask them for the recipe, plus I imagine it isn’t quite the done thing, so this winter I set about trying to recapture it in all it’s glory. My little boy told me it was his “second best soup” but could I leave out the nuts next time. So I’ll give that a go next time. I decided against telling him about the blue cheese – devious I know… the things we Mothers do to feed our families! Feel free to mess about with the quantities as you see fit. My soups are generally made for 3-4 people and I never really measure, but I’ve tried to give accurate measurements here. If you are including the walnuts, make sure they are fresh and not rancid by tasting them before adding them. A walnut that isn’t fresh has a very bitter taste and will overpower and spoil the soup. I don’t always trust the “best before” dates either, better to check for yourself. Wash and break the broccoli into florets, discarding the central hard woody stem. Peel and chop the garlic and onion very fine. In a large saucepan, gently sauté the onion in the olive oil. Add the garlic when the onion is already soft and almost translucent so you don’t overcook/burn it. Add the broccoli florets and cover with the stock. Bring to the boil. Reduce the heat and allow to simmer gently for about 10 minutes or until the broccoli is soft. In the meantime, chop the walnuts and dry fry in a separate pan over a low heat, toasting them until they are fragrant but not coloured. Remove from the heat. 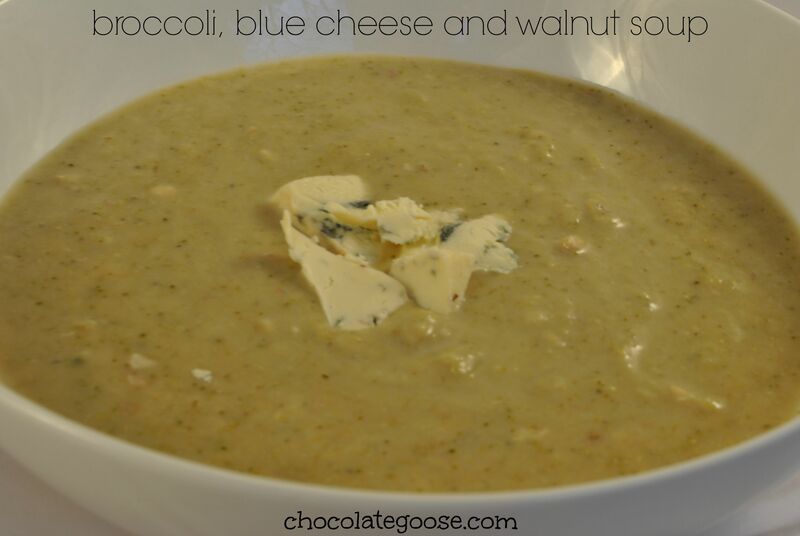 Break the cheese into bits and add, along with the walnuts and cream, to the soup. Carefully transfer the soup to a liquidiser and blitz until almost smooth. You may prefer to do this in stages instead of overfilling the liquidiser. Lastly, return to the saucepan to heat through. Season with salt and freshly ground pepper if needed and serve with a few shavings of blue cheese on the top. Accompanied by freshly baked bread, this is a hearty filling meal for anyone.